The Nobel Committee has arranged for well-known war mastermind Henry Kissinger to speak as an honored guest at a forum that is part of the Nobel Peace Prize events. 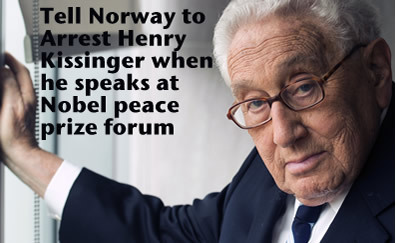 Several of Kissinger's crimes come under treaties that make it mandatory for Norway to prosecute. Kissinger is complicit or a main actor in many violations of the Genocide Convention and of the Geneva Conventions. Arrest and prosecute Henry Kissinger. 7377 1 year ago Rafael Barrantes Bonilla San Jose, CR Por ser responsable de tantos asesinatos, en los cargos que tuvo. 7375 1 year ago Anonymous CR Por tantos crímenes de lesa humanidad debe ir a la cárcel. 7374 1 year ago Isabel Ducca San José, ot , CR Un asesino es un asesino aunque haya recibido un Premio Nobel de la Paz. La Comisión Nobel puede reconocer su error y reivindicarse. Please arrest and prosecute Henry Kissinger. 7365 1 year ago madeleine mccristal hepburn, ot , AU How do they keep getting away with these terrible crimes against humanity . 7363 1 year ago Jens Müller DE , DE same rights for all, otherwise their is no democracy. 7361 2 years ago eileen bailey Coventry, GB He should have been arrested years ago. >> New Yorker: Does Henry Kissinger Have a Conscience?